CHICAGO--(BUSINESS WIRE)--Mar. 1, 2017-- On orders from Control, SafeHouse agents will neither confirm nor deny that legendary Milwaukee destination (and famous spy refuge), The SafeHouse, will officially open its covert Windy City location to the public on March 1 at 5 p.m. However, reliable sources have reported this to be factual. 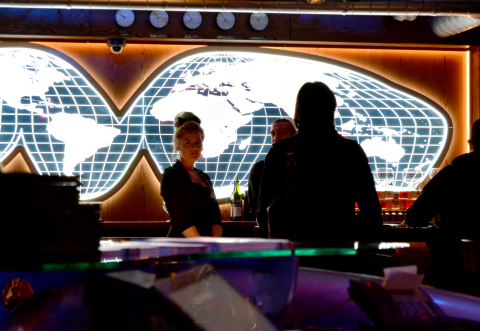 SafeHouse Chicago, a refuge for weary spies, maintains the establishment's treasured 50-year legacy while adding upgraded experiences to the new location, including new technology and a modern design by Chicago’s own award-winning firm, The Gettys Group. On orders from Control, Station Chief Agent OH-OH-7 (aka David J. Baldwin) founded SafeHouse Milwaukee in 1966. His vision for this spy-themed hideaway was unique and full of historical references. SafeHouse became a local landmark and cultural icon for hungry spies. Agent OH-OH-7 and his Chief of Disinformation Agent Eliza remained undercover for nearly 50 years. Their secret was service for all spies who came in from the cold – or from the warm. Today, Agent BB (aka Greg Marcus, The Marcus Corporation President and CEO), and his team of friendly Marcus Restaurant agents continue Agent OH-OH-7’s vision. In addition to upgraded technology, the SafeHouse Chicago integrates more technology and upgraded aesthetics for agents operating in the modern world. The design of the SafeHouse was led by award-winning design firm, The Gettys Group, and Agent Fudd, Paul Daurio. Original espionage artifacts are an integral part of the décor, including the flight deck from an authentic spy plane donated by the man who flew it in WWII, as well as a piece of the Berlin Wall secured from covert operatives. From the sleek Interpol Bar to the Spybrary, to the Seduction Lounge and the Interrogation Room, every aspect of the design has been tinkered, tailored, soldiered, and spied. Interactive elements such as a Gadget Bar featuring a nightly magician, and “futuristic” technology, fuse seamlessly in an action-packed atmosphere where food and signature drinks unite guests as they embark on their mission. Headquartered in Milwaukee, Wisconsin, The Marcus Corporation is a leader in the lodging and entertainment industries, with significant company-owned real estate assets. In addition to its Marcus Hotels & Resorts division, the company’s movie theatre division, Marcus Theatres®, is the fourth largest theatre circuit in the U.S. and currently owns or operates 885 screens at 68 locations in eight states. For more information, please visit the company’s website at www.marcuscorp.com.